I'm woodsmoke, and I'm the creator of the RepRap Intro 3D Printer assembly project. It's an easy epic win for novice designers and engineers. The project is now on Github. What is the RepRap Intro? The project is fun, original, easy, hands-on, step-by-step and learn-by-doing. It comes in a range of implementations, including a low-cost entry level model. It has lots of 3D printable parts, simple, robust electronics & few precision components. It's fully rebuild-able, so the educational experience can be repeated in schools & fab-labs. It has a long tail of upgrades that can be printed out, or cut from sheet material. Eventually it will be the vehicle for modular, practical, educational content in hardware Design & Engineering. I really believe in the importance and potential of 'educational' 3D printing. So much more can be done with 3D printers, once we really get to grips with the technology. But that takes time, experimentation and education. A long time has been spent developing the Intro hardware. But the educational experience at its core has been left behind a little. The assembly guide Versions 3 and 4 will be brighter, more engaging and inspired by comic book art. This is a critical part of the project. But it still needs more design and testing. They need user trials with the least technical students we can find. The project is strongest when the learning curve suits everyone. Open source hardware development has the potential to work very well, if it focuses on a modular, expandable platform, and a clear road map. This is my attempt at an ideal platform. Next we can sketch out and propose a map forward. It will be interesting to incorporate what other people have to say about project direction. And when other developers see the potential, maybe they will start to contribute design work and testing of their own. Development of the RepRap Intro began two and a half years ago. The journey to get there has taken longer than expected. During that time, the potential scope of the project has grown and grown. New electro-mechanical features have been incorporated. For a while, I was working full time, investing personal savings to keep it going. The hope was eventually reaching a sustainable income, selling something I helped create. But my development funds run low, and the project still isn't ready. Is Patreon the way to keep it moving forward? What I'd like to know. If you like the design and development work that's been shared here so far, or you see the project's potential to develop further, please consider contributing as a patron. Or even better; join in with your time and talent in design content and hardware improvement. That way we can continue it together. Your donation will afford 3Distributed the time to complete the next draft of the on-board assembly manual. I'll also test kits with novices in local educational spaces. And I will document our progress, sharing it with you on the campaign page. As for your time and talents. They can strengthen the platform, drawing more interested users to our project. More users mean different skills and a richer platform overall. If we’re successful, what you do early on may go on to define the project for years to come. That's up to you. I have done as much as I can on my own. The wisdom of the crowd can teach us a great deal. Time to ask it about the RepRap Intro. With funds beyond break even for the R+D work space, we can start investing in professional equipment and expertise to enrich the subscriber content. The project will be much stronger following input from other Design specializations. Think user experience (UX), industrial design and electrical engineering. Maybe growth is slower, that's fine too. We'll tackle the design as we can afford it, one step at a time. Or with volunteers from the Open Source Community. One way or another, eventually we'll take the result of our efforts forward to a wider audience. A 3D printer pre-funder campaign. The Educational assembly / operation instructions. Democratic progression towards a mature technology. So take a risk with me, invest in the technology and training for a new generation. 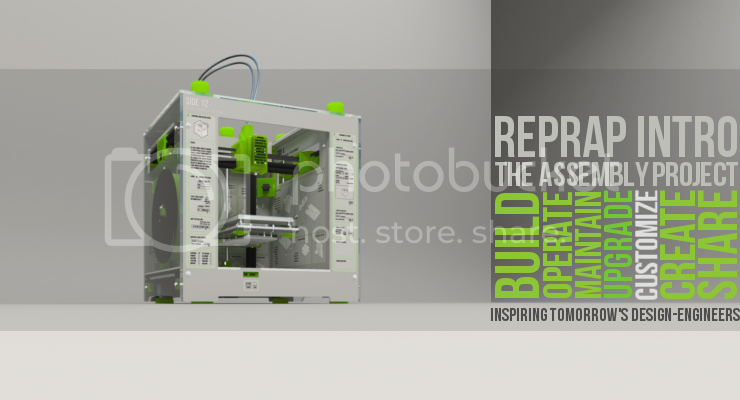 What is RepRap and what made the RepRap Project? Thank you! Access to all Patreon Posts and Content. Thank you! All Patreon Posts and Content, Voting Rights on Design Decisions. Distributed Project Development! Thank you! Patreon Posts and Content, Voting Rights on Design Decisions. You can join the monthly Problem Solving/Brainstorming Live Stream with your Questions and Suggestions. Tell me where the project should be headed! Thank you! All of the above, and A 'Designed-2-Build' RepRap Intro Business Card, Shipped Worldwide. Thank You! Everything else, and 3Distributed 3D Printing Technical and Creative consultation over Skype. 20-30 minutes per monthly pledge. Open Source Hardware is Free. But Freedom requires sacrifice. Up until now the RepRap Intro was developed privately. But after two years it's still incomplete. And it might well be a victim of one designer's eccentricity. Only time and constructive contributions from an interested audience can keep it moving forward. So how about it, are you in?